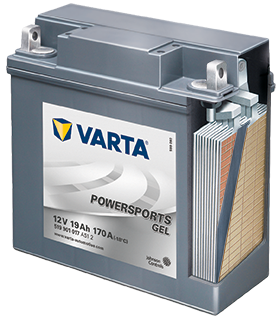 Seasonal use and sporadic recharging both place specific demands on your motorcycle's battery. That's why touring bikes require gel technology (used in our Powersports gel batteries) for maximum performance from the start. The battery acid is suspended safely in gel, making the battery 100% leakproof. For quick installation with no fuss, the battery can be fitted at any angle. Designed to be maintenance-free, so there's no time wasted topping it up with water. Lead-calcium alloy is coated on both the negative and positive electrodes. The result is not just a longer-lasting battery but consistent starting power and extremely high cyclic stability, so it can be charged and discharged hundreds of times. The tough case provides excellent resistance to vibration, helping you ride further on rougher roads.